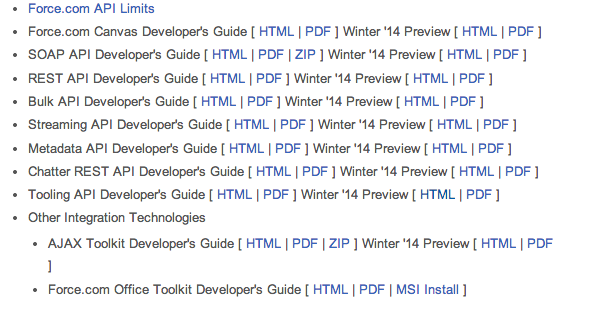 Does any body know where can i find winter 14 updated Visualforce developer Guide and Apex developer Guide? You can typically find these and others after a release on the main docs page here. The official Visualforce Developer’s Guide is still on the version 28.0. But you can read the Winter14 Release Notes.On page 221 you'll find all the innovations regarding Visualforce. And new Apex features on page 235. If I'm not mistaken the rest must remain the same. Where can I find Chris Barry's 2013 Apex Developer Training Videos? Can we use apex and visualforce pages with Site.com? What is System.Page and where can I find a reference for it? Can we find unused methods in Apex?